The milling system Type 428 has been especially developed for machining aluminium and non- ferrous metals for the mould and die construction. The tools and inserts show highest working precision for optimal results. The milling system provides smooth running with lowest vibration rate due to a neutral fitting position of the insert and differential tooth pitch. Perfectly balanced geometries enable long tool life. Optimized cutting edges and cutting materials provide secure mode of working procedure and excellent surfaces at the same time. The inserts are available as precision-ground type with polished chip-breaker groove and edge radii 1,0. The polished chip-breaker groove prevents build-up material on cutting edge. The application areas are roughing and finishing of non-ferrous metals and aluminium with Si-content up to 12%. They enable an axial depth of cut up to max. 8,0mm. Both available qualities K15M and AL20 could be used for dry milling as well as for milling with coolant. All tools include internal coolant passages. The tools are equipped with large chip spaces which provide optimal chip flow. Nickel-coated surfaces cause higher resistance against reweldings and corrosions. The tools are available as shell type mills within diameter range of 32-50 mm, as shank type mills with diameters 14-32 mm and screw-in cutters in diameter range 14-32 mm. 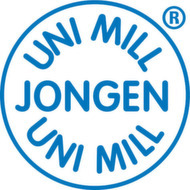 The shell type mills are made to DIN 8030-A and shank type mills to DIN 1835-B (Weldon). 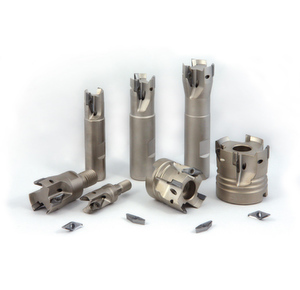 The screw-in milling cutters are compatible with mainly commercial available adaption-systems.